GPS with Mr. T: "I ain't gettin' on no plane"
I'm a pretty good navigator, and I'm usually not too worried about getting lost. Except for that time I ended up in East Boston, a neighborhood I hadn't realized existed ( East Boston? Isn't that the ocean ?). So I've never really had an urge to get one of those GPS navigation doohickies. Until now. The fact that GPS maker Tom Tom will be offering celebrity voices to navigate you on your journey is pretty damn awesome. 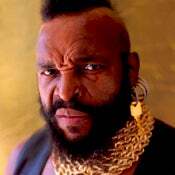 Even better, the first three celebrity voices are Dennis Hopper, Burt Reynolds, and Mr. T. Granted, you'll have to pay $10 for the privilege of Mr. T telling you "I pity the fool who don't get off at Exit 17." Meanwhile, Dennis Hopper will be interjecting anecdotes about that local burger joint where he totally chowed down when he had the major munchies. I'm holding out to be asked to do my Sean Connery impersonation for the next set of voices: "Do you exshpect me to navigate? Turn left. Hard left."